We’re now beginning our third week in France. 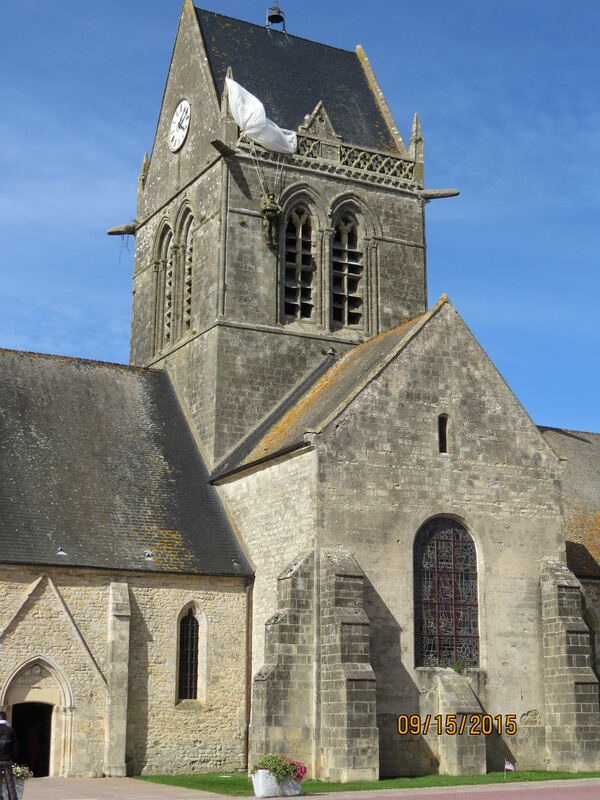 Our apartment is in central Caen, in Normandy, about 6 miles from the English Channel. Caen, a city of about 100,000 doesn’t have the medieval feel of most towns in France because the city was almost totally destroyed by the Allies during the Normandy Invasion. But the Caen Memorial Museum is wonderful. We spent several hours there getting an overview of the events that led up to World War II as well as the specifics of the Normandy Invasion. On a warm sunny day in September it’s difficult to imagine all the ships and men coming ashore on any of these beaches. 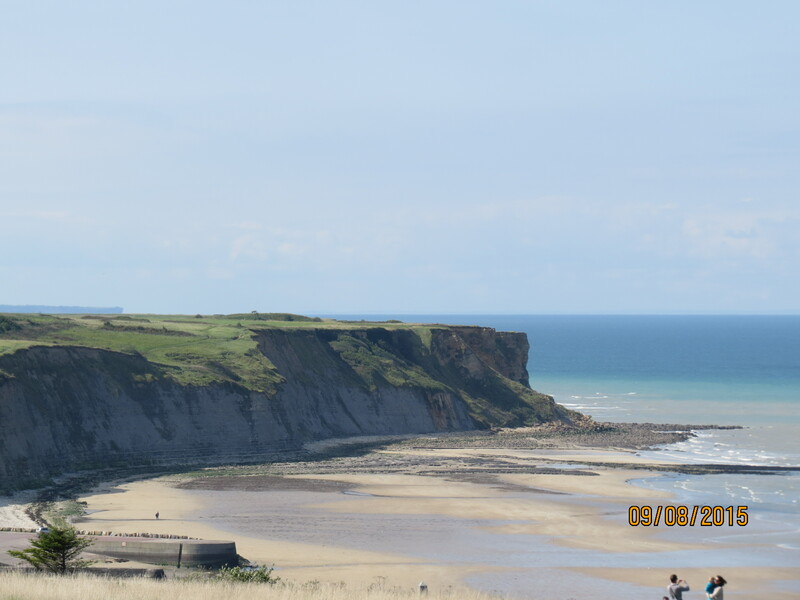 But the cliffs of Omaha Beach were unbelievable. 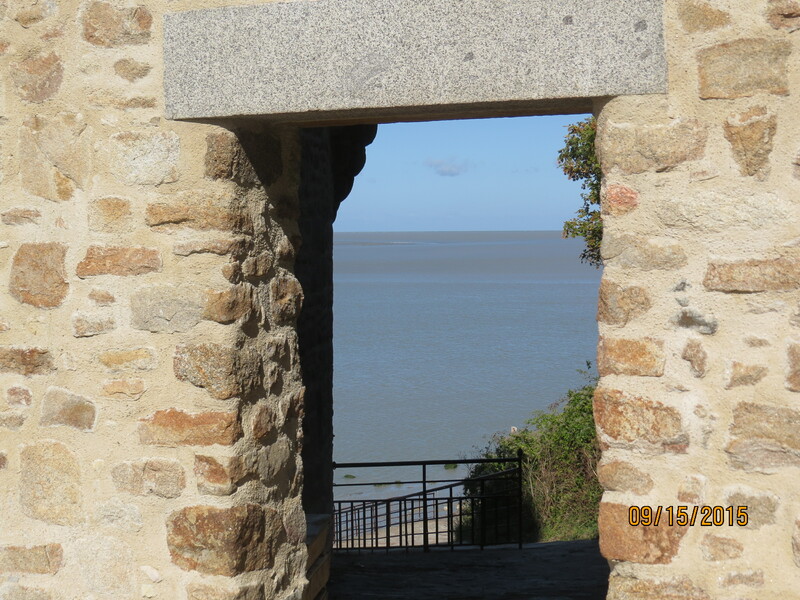 As we looked out at the landscape, we understood why the Germans didn’t think anyone would attempt those steep climbs. the town where the paratroopers descended from the sky. The light from the bombs made the paratroopers sitting ducks for the Germans. The local church has a depiction of Pvt. John Steele (portrayed by Red Buttons in The Longest Day) on the side of the church where he hung, pretending to be dead, for hours before he was rescued. Besides World War II history in the area, the Abbaye aux Hommes in Caen dates from 1063 when it was founded by William the Conqueror who, after marrying his cousin Matilda, was trying to get in good with the Pope. (The Abby was also used as a place of refuge for the locals during World War II.) William the Conqueror is buried here…well, at least his thigh is! Seems they had some problems getting him into his tomb, but that’s a whole ‘nother story. There just so much to see and do in this area. 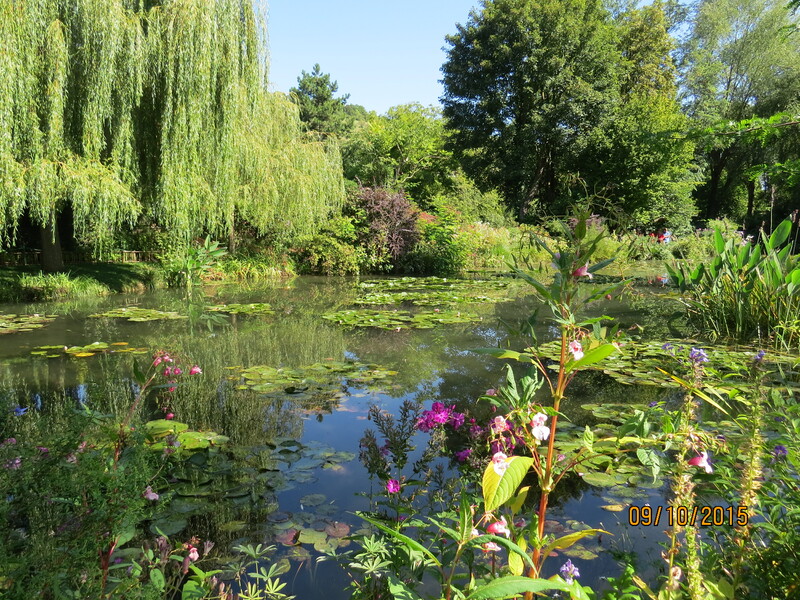 We’ve been to Monet’s Garden in nearby Giverny. 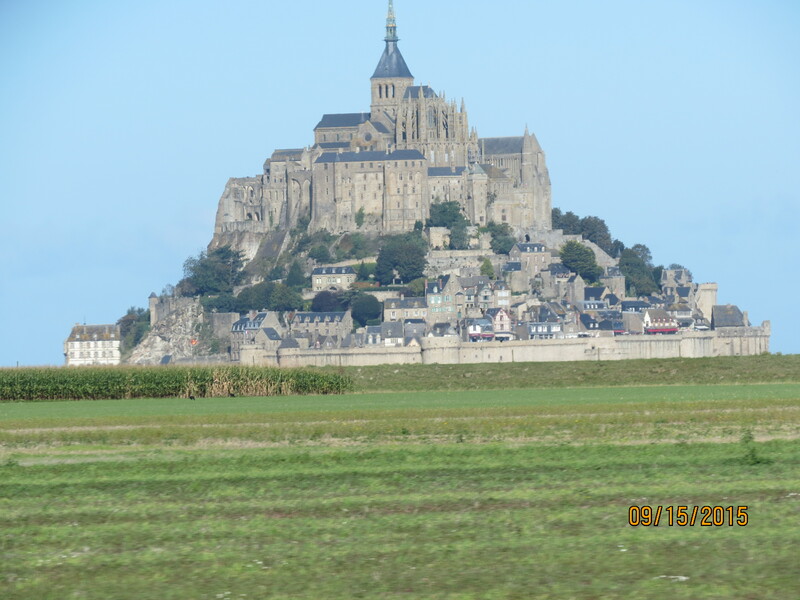 We’ve visited Le Mont St. Michel, an absolutely breathtaking location. Many have asked about our favorites. The slower pace. Wherever we’ve been in the Netherlands, Belgium or France, people are enjoying their day. There are lots of outdoor cafes. Shops generally close between noon and two (or 1:30 and 3:00). Even French schools take an hour to an hour and a half for lunch! The friendly people. People are generally really outgoing. We have found Airbnb in Europe to be a very personal connection. In the Netherlands and Belgium, our hosts have made sure that we always feel welcome and cared for. France is no exception. Our landlord is out of town on business but connected us with his friend Francoise, a charming woman who showed us through our apartment and has been a good friend since…checking in with us and providing us with local maps. We returned from a day out to find a gift from her of fruit and homemade jam! She can offer a local perspective because she’s lived the history. When we first arrived, she explained to us that most of the buildings here, including the one we’re living in, were built during the reconstruction of the city in the 1950s and 1960s with Caen limestone. This is the same limestone that was used in the building of Westminster Abbey and the Tower of London. Bob and I both got haircuts (Bob primarily a beard trim) last week. The woman in the shop spoke little English…nothing beyond, “Would you like a cup of tea or coffee?” And we don’t speak French. We used our hands a lot, nodded, and laughed a lot. 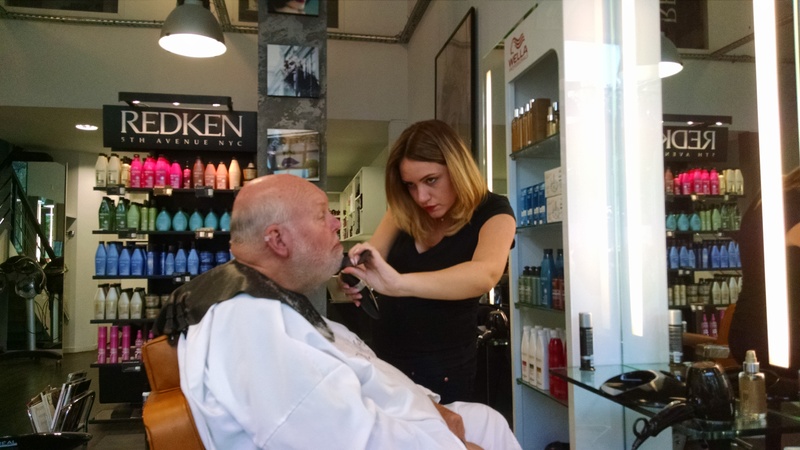 Both Bob and I left there feeling really good about our haircuts! The markets. Every city seems to have a market and the quality is amazing! Never have I tasted tomatoes as divine as these! And the markets include fruits, vegetables, wine, cheese, olives, seafood, sausages. They are fabulous! So what do we miss? Friends and family are a given. 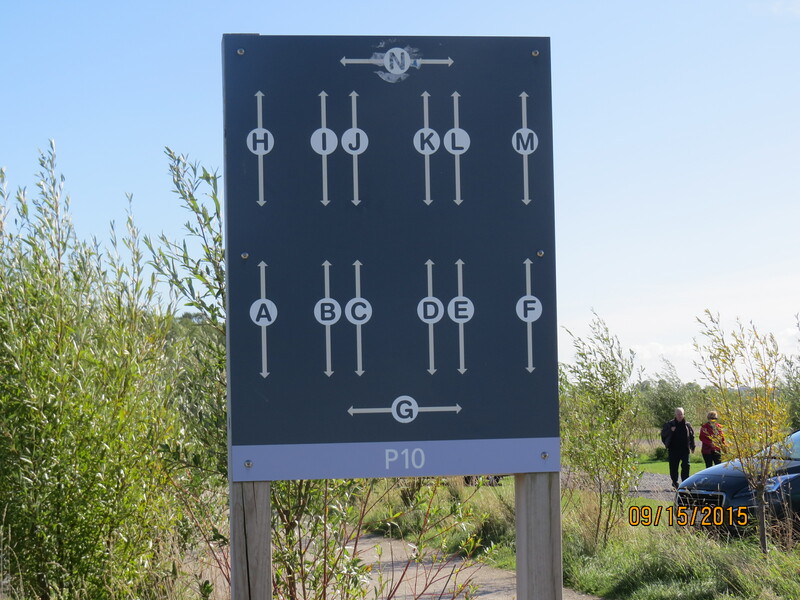 But beyond that, the lack of continuity of driving signs creates some frustrations. Labels on the pavement that say “bus lane” are helpful, but when arrows appear in the middle of the road, it takes some guessing to figure them out. I have learned to take pictures in large parking lots where there are little markings. Makes it much easier to find the car later. We love that our car has a GPS but because it uses stored maps instead of the internet, problems arise when there are road changes. For instance on the autoroute, we took yesterday, we’re in the middle of rural France on a four lane divided highway and the GPS says, “In 10 meters turn left.” That’s pretty easy to ignore. We just continued as we were going and all was well. But not all issues are so easily resolved. Returning to Gent from eastern Belgium we didn’t think we were ever going to get out of a small town in southern Belgium. We had been making good time when all of sudden the GPS put us into a circular puzzle. After 3 passes at the same route, we stopped at a food truck where we saw half dozen people, hoping one would speak English. No, they said, no one spoke English, but one gentleman saw my map and immediately took it. He began pointing to where we were and where we should go. The woman working in the food truck began speaking a little English, only to tell us that the roundabout we were supposed to use (and that we had already passed several times…) was NOT closed. We thanked them and went on our way. We finally just ignored the GPS, drove about 10 kilometers in no precise direction, turned the GPS back on and it guided us safely back home. Our new philosophy is, when in doubt, just turn it off, drive a few k and then turn the navigation system back on. It may not be the most efficient, but it works.